Digital light meters, or as they are also known luxmeters or luminometers, are most commonly applied in movie-making and set design environments to ensure the best lighting for the scene (Source). They are great for measuring total visible light in a particular area (Source). Other applications include residential utilities where they can be applied to decrease the extent of wasted light in the home, assess outdoor light pollution, and to gauge the best light levels for plant growing (Source). and making sure that a building electrical code is up to standards. Let's take a look at five of the best-selling looks meters on the market today and see how they compare. This 9-volt, Dr. Meter Digital Illuminance meter is a great product for those working in the field of electricity or lightning. Since the electrical code mandates the amount of illumination for each building, this product becomes necessary equipment for professional contractors and electricians. The comparison of different light fixtures used in the same setting. This LX1330B meter has a measurement range of 0 – 200,000 Lux, and can be used for a variety of different applications. 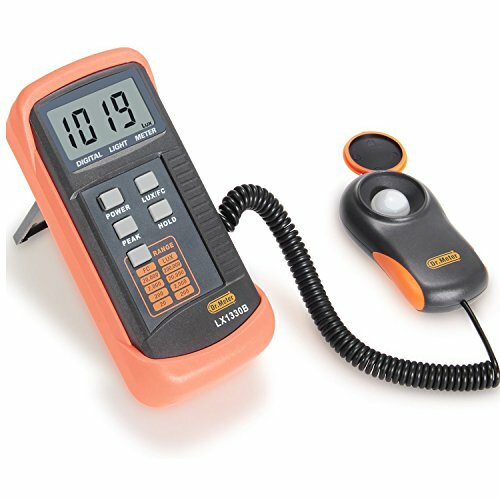 This digital Luxmeter light meter comes with an LED display and measures a range up to 50,000 Lux. 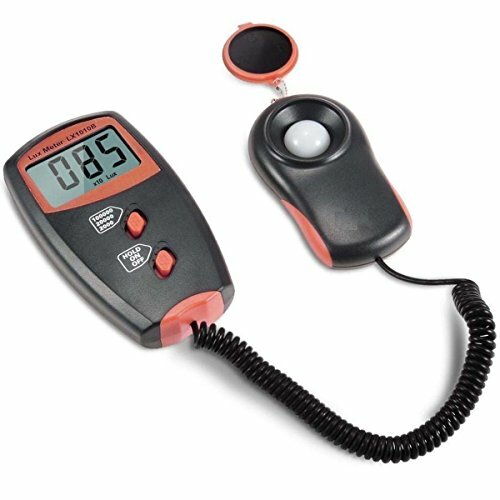 Many users have reported this digital light meter is great for home use because of its decent accuracy and functionality. You can measure the approximate light brightness according to the human eye. 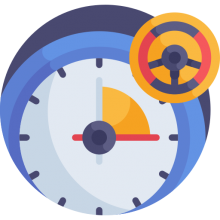 While this meter is not meant for photography, you can still use it for this purpose using formulas for conversions. This Illuminance Light Meter Measure Tester comes with a measurement range of 0.1 to 200,000 Lux, 0 to 185806FC. Measurement speed of the product is 2 times per second with its 9-volt battery. The digital LCD screen is supported with a backlight, which does not consume much power. It automatically shuts off if you are not using it. The digital LCD Lux meter also gives you an indication for low battery. The high resolution and quick response of this particular meter makes it a great buy at a relatively cheap price. 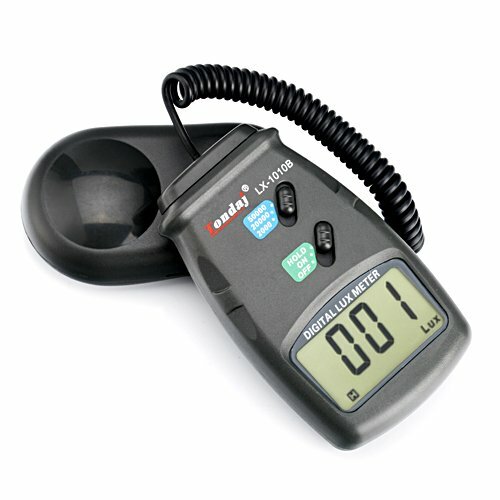 This LCD display Digital Luxmeter Light Meter can measure light up to a range of 0- 100,000 Lux with an accuracy of ±5%. The sampling can be done in only 0.4 seconds. Some users say that the LCD display of the digital Lux meter is a major plus- it is highly responsive and accurate. The auto zero feature of the product forces the displayed frequency turn back to zero if a pulse input is not obtained within a fixed time during the process of measurement. The over range indication is also a helpful feature. The product is supported by the data memory. When the battery is critically low you will receive an alert- another useful feature. This US-enabled, 400K Lux Light Luxmeter comes with a pre-packed long-life silicon photo diode. Users love the measurement accuracy of this Lux meter- which is 1.5 times per second. The LCD display gives 4000 counts along with the 41- segment analog bar graph. One of the more user-friendly attributes of this product is that you can select from Lux and FC. 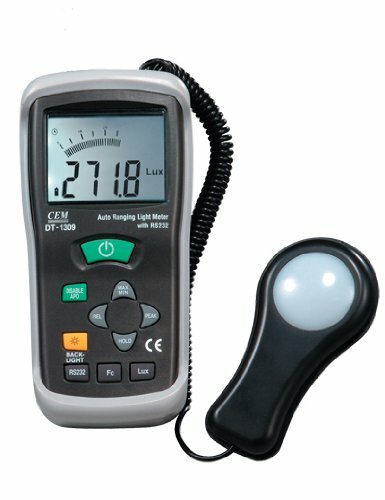 The CEM DT-1309 CE certified digital light meter comes with a large display of 4 digits- great for readability. If you're looking to purchase a digital luminance light meter, you are probably interested in measuring the lighting in a particular area. Whether you are a cinematographer, a set designer, or somebody just trying to get the perfect amount of light for their delicate indoor plants, there are many inexpensive and high quality digital light meters on the market today to choose from. These devices are pretty simple to use and generally deliver accurate results. 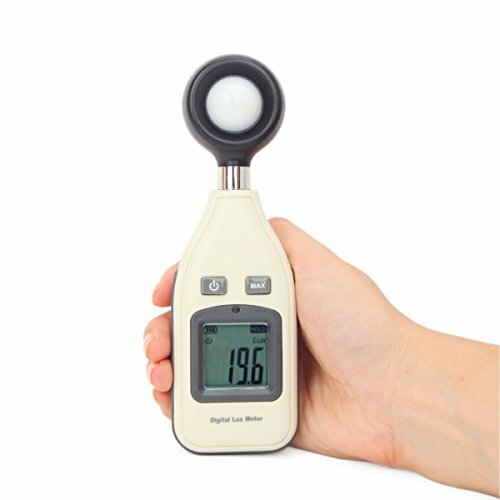 We should say that if you need something for intensive scientific research, you may want to shop around for a more robust digital light meter than we have reviewed on this page. Users have commented that it is not ideal for measuring your fish tank lights or grow lights, because most plants use red and blue, while these locks meters measure mostly green. Make sure you understand your personal requirements before purchasing a digital light meter- reviewing the product pages and what other users have said about the models they have purchased is a great way to get added insight into the purchasing decision you are making.